Hasn't been any more discussion on the upcoming KINO silent Blu-ray releases since mid-May. There are some early website reviews coming in on Valentino's Son of The Sheik, but not enough info yet. Supposedly the 2K transfer to BD provides some improvement over earlier DVDs while utilizing the same source elements. Current pricing is reasonable, but are these two Valentino films worth the double dipping? I'm open to it, but may have to wait for screenshot comparisons. I'm all-in for other upcoming KINO silent features, but still on the fence about Sheik & Son of The Sheik. I want to be fully supportive, but if there isn't enough visual improvement to warrant it, music options may be the deal-breaker. Anyone have these yet? Opinions? My review of Zaza is here. Mike Gebert wrote: My review of Zaza is here. Thanks for the review, Mike. I'll be checking that'n out. The narrower image suggests there was an early optical soundtrack for the '26 Son of The Sheik, probably orchestral. Wonder what happened to it? R. Cat wrote: The narrower image suggests there was an early optical soundtrack for the '26 Son of The Sheik, probably orchestral. Wonder what happened to it? Probably from the '37 re-issue. Mike, you already got your copy?? Thanks for the kind words about the accompaniment for ZAZA! It was something of a challenge to do music that tried to keep up with Gloria without going too far, but I was pleased at how it turned out. I want to thank Rodney Sauer (happy birthday today, by the way) for unearthing sheet music called for in the cue sheets, most of which I'd never heard of. And thanks to Rob Stone at the Library of Congress and Bret Wood at Kino Lorber for giving me the chance to score ZAZA. Here's one thing I found odd: the film features an old French love song, "Plaisir d'amour," played several times on piano, and we even see the sheet music onscreen. But the cue sheet called for an entirely different song! So I used my accompanist's prerogative and went with Plaisir, even though it sounds exactly the same as "I Can't Help Falling In Love With You" as sung by Elvis Presley. If anyone's interested, plans call for ZAZA to be shown at the upcoming Western New York Film Expo (Sept. 1-4 in Buffalo) with me doing the score live. Looking forward to it! It's a really fun movie and like most silent film, works best when seen in a theater with a live audience. Last edited by Jeff Rapsis on Wed May 31, 2017 9:28 am, edited 1 time in total. R. Cat wrote: Hasn't been any more discussion on the upcoming KINO silent Blu-ray releases since mid-May. There are some early website reviews coming in on Valentino's Son of The Sheik, but not enough info yet. Supposedly the 2K transfer to BD provides some improvement over earlier DVDs while utilizing the same source elements. Current pricing is reasonable, but are these two Valentino films worth the double dipping? I'm open to it, but may have to wait for screenshot comparisons. I would be interested in some reviews/opinions as well. I don't have on either on DVD, much less bluray... so I will probably get both anyway. But just curious what others think of these releases. The blu rays came in the mail yesterday, and I watched them last night. Both prints are worn, Son of the Sheik much more so than The Sheik. With The Sheik, you see the wear in the intertitles and in several scenes near the end; but while the film hasn't had a full-out restoration, it looks leagues better than any previous incarnation I've seen. The gloppy, oversaturated tinting that marred both the VHS and DVD releases (Sleight of hand to gloss over the scratches?) is gone, and the present tinting is far more subtle. The new level of detail in costumes, sets, and backgrounds is very impressive--not on par with, say, Kino's blu ray of The Cabinet of Dr. Caligari, but impressive enough that I often got the feeling that I was watching the film for the first time. Ben Model's organ score is first rate. I'd buy this one again in a heartbeat. Now a caveat emptor about Son of the Sheik: if you do a chapter spot check for image quality, you're going to be very disappointed, for wear and scratches abound, an effect compounded by the new, scratch-free intertitles. But watch it from the beginning, acclimating yourself to a certain degree of wear, and it works somewhat better. Somewhat. The image is scratchy and rather soft throughout, but it too is has better detail than any earlier edition I've seen. The Alloy Orchestra score is all right, for my money more effective in the quieter scenes than in espresso-speed counterparts. Son of the Sheik is probably the better movie-as-movie of the two, worth the discount price of $17.40 from Amazon, but I would not pay the $29.95 retail. If you can get that discount, I'd say it may be worth the upgrade. 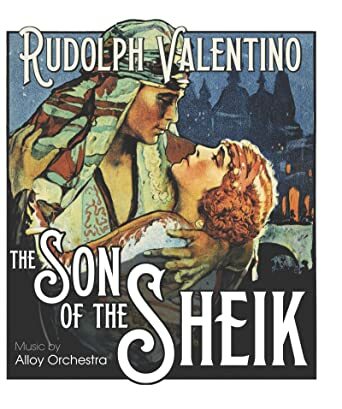 I did not listen to the commentaries, but the other extras are fine; The Sheik's Physique--here titled Valentino on the Beach on the SOTS disc--is taken from a much sharper print than in the past, with the erstwhile s-l-o-w speed corrected. Bottom line: the Paramount series is off to a good start--in the case of The Sheik, very, very good indeed. Last edited by Dean Thompson on Wed May 31, 2017 7:14 pm, edited 2 times in total. Occasionally I get sent review copies. I never request them, but they happen sometimes anyway. Fantastic! Thanks Dean. Really glad to hear you liked the organ score for The Sheik. Like others, I am a little wary of the Alloy/modern score on Son of the Sheik. But honestly, I felt the clips provided earlier in this thread were better than I thought. Looking forward to watching these! The Sheik arrived yesterday and I watched it last night, as well. Ben Model's excellent score is worth the price alone. As mentioned by others, the print is pretty good, some wear, but nothing terrible. The tinting is fine and the film is fun. Much better than the old Paramount VHS. The Blood and Sand trailer and Valentino funeral(s) montage are the cinema extras. I have not listened to the commentary. I give this a solid recommendation, well done KINO. Watched The Sheik last night. Fun watch. Definitely a "light story" and easy-breezy to follow, but fun to see how one of the most iconic stars of the era -- perhaps of all time -- was created. The organ score was spot on. I enjoyed it very much -- kept me involved in the picture and in the spirit of the film and its era. The extras are light but great additions nevertheless. I thought the film look great. There were a few blurry scenes but for a film that didn't see an expensive 4k restoration or anything -- we're extremely lucky. I noticed some of the titles were in rough shape. When the film started, I was concerned it was going to be a rough watch -- given the main title's condition. But the film looked really good. Are these all the original titles? They looked it to me, but I never know with all the history and re-releases that silents were often subject to. Looking forward to watching the Son of the Sheik tonight! Just a heads-up: Beggars of Life just listed as available for pre-order on Amazon; current release date is August 22. "Musical score compiled and performed by The Mont Alto Motion Picture Orchestra, employing selections from the original 1928 Paramount cue-sheet." Ordered. This is the Kino/Paramount release I've been most eager to see; I know the film only from a very dupey VHS long, long ago. Dean Thompson wrote: Now a caveat emptor about Son of the Sheik: if you do a chapter spot check for image quality, you're going to be very disappointed, for wear and scratches abound, an effect compounded by the new, scratch-free intertitles. But watch it from the beginning, acclimating yourself to a certain degree of wear, and it works somewhat better. Somewhat. The image is scratchy and rather soft throughout, but it too is has better detail than any earlier edition I've seen. The Alloy Orchestra score is all right, for my money more effective in the quieter scenes than in espresso-speed counterparts. Son of the Sheik is probably the better movie-as-movie of the two, worth the discount price of $17.40 from Amazon, but I would not pay the $29.95 retail. If you can get that discount, I'd say it may be worth the upgrade. I must admit I was rather disappointed. I love the film and enjoyed watching it, but the image quality on the bluray ranges from so-so to quite bad. Parts of it are as bad as the newly-discovered METROPOLIS scenes. Scratches and other damage abound. Also, does anybody know if this is from a 16mm print? I'm glad for every silent release, especially in HD, and will faithfully buy them, but I had hoped for better here. I guess we have been spoilt recently, what with CALIGARI etc. This is absolutely the case, Arndt. Metropolis overcomes the weaker rediscovered footage with strong meticulously restored 35mm film elements. At times the transitions may be a little jarring, but those scenes are fleetingly short in duration and provide more insight into the genius of the unedited release. With The Sheik and Son of The Sheik the source material hasn't improved much over earlier DVDs either by added footage, restoration of existing footage or new orchestral score. Alas, there's little motivation to double-dip for what amounts to standard definition (DVD quality) releases on BD. Top it off with the fact that these are relatively short features that might've been better served as a single package reissue and there's less of an itch to pull out one's wallet. The last thing I want to do is disparage the release of inarguably classic silent films (like these renowned Valentino films) on the best possible medium, but we need to encourage distributors to provide value for our dollars ...and Euros... spent. If the goal is winning over niche market customers, the rules of the road should be pretty simple: locate the best source prints available, clean-up or restore and transfer in high definition, provide missing footage if available, incorporate appealing period appropriate music on the soundtrack and toss in a few extras not utilized in prior releases (shorts, commentaries, documentary, gallery, etc.). Finally, locate and restore films that aren't readily available on any disc format. Fortunately, KINO is promising a plethora of highly anticipated silent features available on BD for the first time in the coming months. Zaza was a great start. Old Ironsides and Beggars of Life are highly anticipated and there's more to come. Overall, I'm very optimistic. Watched my DVD copy of The Sheik last night and thought the print was quite good. There's one sequence toward the end where it's scratchy. It lasted for maybe 5-6 seconds. I noted as I did with Zaza that the DVD version is severely boxed, which it apparently is not on the Blu-Ray. What is the name of that damned song Ben kept weaving into the score? Something with Divine in the title? Last edited by drednm on Sun Jun 18, 2017 10:03 am, edited 2 times in total. Watched my DVD copy last night and thought the print was quite good. There's one sequence toward the end where it's scratchy. It lasted for maybe 5-6 seconds. I noted as I did with Zaza that the DVD version is severely boxed, which it apparently is not on the Blu-Ray. The explanation for your more positive experience is that you were watching THE SHEIK. At least the fact that you are referring to Ben Model's score would seem to suggest that. I was referring to THE SON OF THE SHEIK, scored by the Alloy Orchestra. R. Cat wrote: If the goal is winning over niche market customers, the rules of the road should be pretty simple: locate the best source prints available, clean-up or restore and transfer in high definition, provide missing footage if available, incorporate appealing period appropriate music on the soundtrack and toss in a few extras not utilized in prior releases (shorts, commentaries, documentary, gallery, etc.). Finally, locate and restore films that aren't readily available on any disc format. The question is, if KINO did that for all these movies, could they turn a profit? I've seen screen caps of The Sheik, and it looks terrific. I would much rather have seen that quality in The Son of the Sheik because that's the one I want. Beggars is going to be a 2K scan from a new restoration, and Covered Wagon is a 4K scan. I will expect better quality from those projects, but if the others don't turn out to be great improvements, I won't argue, because pulling out all the stops is an investment that may not yield a return in a niche market. And and let's be honest, silent film fans are a minority of a minority. There aren't many classic film fans and even fewer silent film fans. I'm grateful at this point to get whatever I can get of films that have either never been in print, or out of print since VHS. Thank you KINO! Zaza was as good as I remembered it. Saw it at Eastman about 10 years ago in mute form. Jeff Rapsis' lively piano music was a big plus. Mary Thurman as Florianne was good (she died in 1925) as was Lucille La Verne. H.B. Warner is the only dud in the cast. He was in his late 40s and looked about 20 years older than that. Anyway, I'm sure no one went to see this film to see Warner. It's Swanson all the way. Your point is well taken, and I'm not knocking KINO's efforts, just making an observation. With a niche market, the more successful the sales the more we're likely to see. So, my fingers are crossed in the hope that every silent release from KINO does well. drednm wrote: Zaza was as good as I remembered it. Saw it at Eastman about 10 years ago in mute form. Jeff Rapsis' lively piano music was a big plus. Thanks so much for the kind words! Enjoyed doing music for ZAZA and so glad that this film is now in distribution! Among other virtues, ZAZA helped me more fully understand Swanson's position in the pantheon of big-name silent actresses. She really gives the role everything she had! Also, seeing Gloria do her stuff in this kind of period costume vehicle gives you a sense of how much she was stretching herself in later roles such as SADIE THOMPSON. I have to admit, working with ZAZA has raised my awareness of Swanson's talents. I recommend the film to Swanson fans—and also all those who will probably become such after seeing this film. Zaza was great fun and am looking forward to more silents from Kino Lorber (especially Old Ironsides). peachtreegal wrote: Heh heh, I love H.B. Warner and I definitely do watch silents for him. There's always one LOL.... Note that La Swanson has a mirror in the middle of her fan! Regarding the Kino, SON OF THE SHEIK, this Blu Ray was produced by me for Alloy Orchestra live shows. It was scanned in 2k from the 35mm negative that I purchased from the Killiam Collection. David Shepard's previous DVD release (on Image Entertainment) was done from a print taken from this same negative - making it slightly less sharp. And of course, it was only a standard definition as opposed to the new HD version. Some dust busting and restoration work were done to the image, but the budget prohibited aggressive restoration efforts. A number of really bad frames were retouched to keep the giant white splotches at a minimum, and as many dust marks and scratches were removed as we could afford. The lack of sharpness is partially a quality of the film making (which used lots of diffusion on the lens). It's added to by the generations of copying. Color tints were added to all scenes. The tints are simple Blue (night), Amber (interior), Light Sepia (daylight). They are not based on any notes from the original production. The titles were replaced by Paul Killiam a while ago. It was easier to dust bust the titles (since they were all black) so they look better than the rest of the print. And of course there is a new score by Alloy Orchestra (which I personally think is one of our best, and best recorded). According to Kevin Brownlow, the 35mm negative we worked from is the best version that exists of Son of the Sheik (albeit cropped and scratched). This was confirmed by David Shepard, and later by UCLA in preliminary research before we did the restoration. Cohen Media also owns a 35mm version of the film, which I have never seen. I'm told it is similar (cropped and scratchy). Unless something new turns up, or somebody wants to invest a ton of money into restoration, this will remain the best version on the market. Ken Winokur wrote: Unless something new turns up, or somebody wants to invest a ton of money into restoration, this will remain the best version on the market. A choice of scores would have made it better. Oh, please. The Alloy Orchestra bought the negative, had it scanned in 2K, and now you want them to hire a second musical group for an alternate score? Their score is excellent. Count your blessings. I've never seen Warner bad, from Cad through Messiah through Dying Old Man. The kind of actor who lifts every piece he's in. By the way, I am selling off my collection of films, including the Son of the Sheik 35mm negative and the actual film copyright of the film (shared with Cohen Media - more details on this if you are interested). Want to buy Son of the Sheik? Contact me privately.